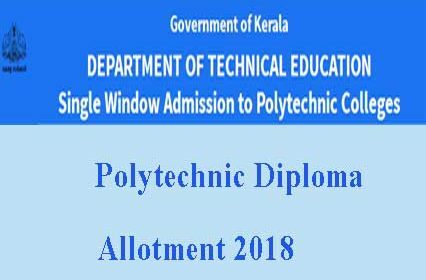 Kerala Polytechnic Diploma First Allotment Result 2018 and the Final Rank List will be published on Kerala DTE Polytechnic admission web site www.polyadmission.org on 2-07-2018. All the candidates who applied for admission to Kerala Polytechnic diploma under DTE Kerala can check their Diploma First Allotment Result 2018 from the web site after the declaration of Allotment and Final Rank List 2018. Kerala Polytechnic First Allotment and Final Rank List : 2-7-2018. Last date for 1st allotment admission : 5-7-2018, 4:00 PM. DTE Kerala Polytechnic Diploma Admission 2018 will be held though the centralized allotment process CAP. The Polytechnic First Allotment 2018 Result will be declared on 2-7-2018. The Kerala DTE has already published trial allotment and then the candidates are allowed to update their options to the polytechnic college admission. All the polytechnic applied candidates are now waiting for the first allotment result form Kerala DTE. The First Allotment Result 2018 and the Final Rank List are prepared based on the Rank of the candidate and the options they selected in the application. The Diploma First Allotment Result is the list of eligible candidates who will be getting admission to the diploma courses in polytechnic colleges in Kerala under DTE. All the candidates who applied to the Kerala Polytechnic Admission 2018 must have to check their allotment status from the Kerala Polytechnic First Allotment Result 2018 that published by DTE Kerala. The Final Rank List can be verified from the www.polyadmission.org web site. Use the same procedure to get the Kerala Polytechnic Diploma Allotment Final Rank List. The candidates who have got allotment in the Polytechnic First Allotment Result for admission to polytechnic college can take the print out of the allotment letter from the Website and join the Institution allotted, submitting the originals of the certificates and remitting the required fee on or before 5-7-2018, 4:00 PM.